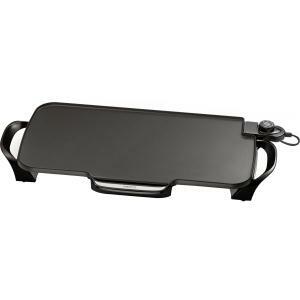 Prest 22" Electric Griddle with removable handes. Extra large cooking area makes enough for the entire family. Textured cooking surface provides enhanced nonstick performance. Removable handles for easy cleaning and compact storage. Premium nonstick surface provides stick free cooking and easy storage. Slide out drip tray removes and cleans easily. Control Master heat control maintains the desired cooking temperature automatically. Heavy cast aluminum base is virtually warp proof. Griddle is fully immersible witht he heat control removed.